Although Schnauzers are popular and endearing, their upkeep and maintenance is a lot more time consuming than some other dog breeds and it keeps owners and professional groomers alike constantly on their toes. Their classic appearance is sure to melt the heart of any owner while the care behind that appearance requires a bit more work than some may expect. It’s hard to beat watching an expert via a video in order to pick up the basics of grooming. And it is especially true of Miniature Schnauzer grooming. Here is a Miniature Schnauzer Grooming Video to help you out. The groomer in this video demonstrates how to approach clipping with respect to which parts of the body to tackle first and how to keep the skin taught while getting that smooth, clean cut. The video above shows grooming a miniature Schnauzer with Wahl clippers. One model that has been very popular is the Wahl Cordless Pet Clipper. There are other models equally popular but the cordless version is so much easier to work with. This cut requires a lot of work to get it up to standard. This very thick coat requires thinning out by hand or hand stripping. The torso usually ends up with a coat length of about an inch with the hair on the legs a little longer. The facial hair has that distinctive look we are so used to, with the eyebrows and “beard” quite long. As you would expect, this cut requires ongoing maintenance. This is a more relaxed style, similar to the Showing cut but not as detailed or exacting. You don’t have to be as fussy. Therefore it is a little easier to do and to maintain. It certainly helps yo keep the coat healthier and easier to comb or brush. For this cut, you remove more hair than in the 2 styles above. 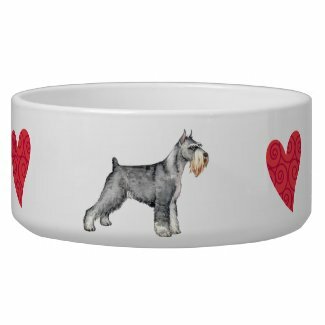 You can still keep that Schnauzer look but have less maintenance to do in the end. This is, as the name suggests, a natural look. The coat is left to grow as it would naturally without clipping and of courser many prefer this. However, this style requires a lot of constant brushing and combing to keep it looking neat and tidy. In order to groom a Schnauzer properly, some essential tools are required to be on-hand prior to beginning the process. Owners should be prepared with some dog clippers, a reliable brush, dog nail clippers and specialized trim clipper guards to accommodate the Schnauzer’s different hair lengths around the body. And of course, depending on the way your Schnauzer has been clipped, you can expect that there will be some hair to remove. Schnauzer fur is thin and long in some areas and therefore is susceptible to matting. In order for your dog to maintain a healthy and attractive coat, brushing must be a regular part of your routine to keep the mats at bay. Brushing should be done at least bi-weekly and can avoid the tedious process of having to cut out chunks of fur as a result of difficult knotting or tangling which causes mats to occur. Brushing should be consistent and should be applied all over the body with a focus specifically on the longer hair around the face and ears. The longer hair around the face of your Schnauzer should be carefully and regularly trimmed as a precaution against mats as well as visibility and care when eating or drinking. In order to prevent possible infection, use blunt-tipped scissors or grooming clippers and cut with the grain of the hair itself and not against it. A longer clipper guard like a 15 is your best bet in order to preserve the Schnauzer’s unique and beloved appearance while also seeming neat and tidy. The Schnauzer breed often exhibits longer eyebrows that can impair vision significantly so while trimming the facial area make sure to pay attention to the eyebrows as well as the longer strands of the hair framing the face in general. The rest of the body apart from the face and tail can be clipped with a shorter clipper guard – most preferably around the 10 range. The body should be trimmed evenly beginning at the neck all the way through the back area to the tail. In order to trim the longer hairs on the underside of the Schnauzer use a pair of scissors with caution to avoid accidental cuts. The tail can be clipped with a significantly shorter clipper guard to maintain a neat appearance. Snags in the Schnauzer fur are common and can lead to infection and pain so moving with the grain of the hair is essential for your dog’s comfort and health. The tail, once completed should have no remaining curly hair. Schnauzers require a stronger than average pair of toenail clippers. In order to trim the nails easily and successfully, have the dog lay down while you trim the nail. Make sure to clip the entire point of the nail but do not cut any further down than the white part of the nail, known as the quick. Trimming past the quick can be extremely painful and can even cause slight bleeding. And here is a grooming book to help you. This book, Notes from the Grooming Table is an all time favorite with professional groomers and dog owners alike.